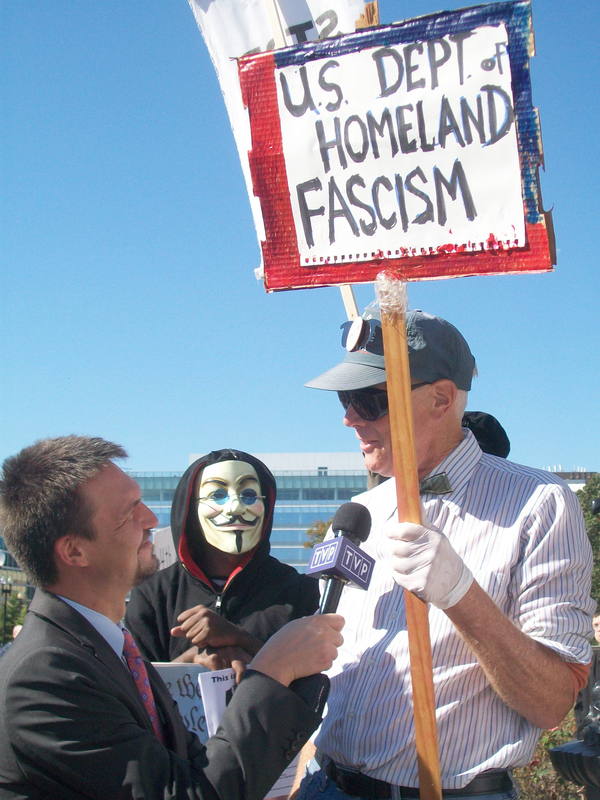 Has the NSA protest hit critical mass? 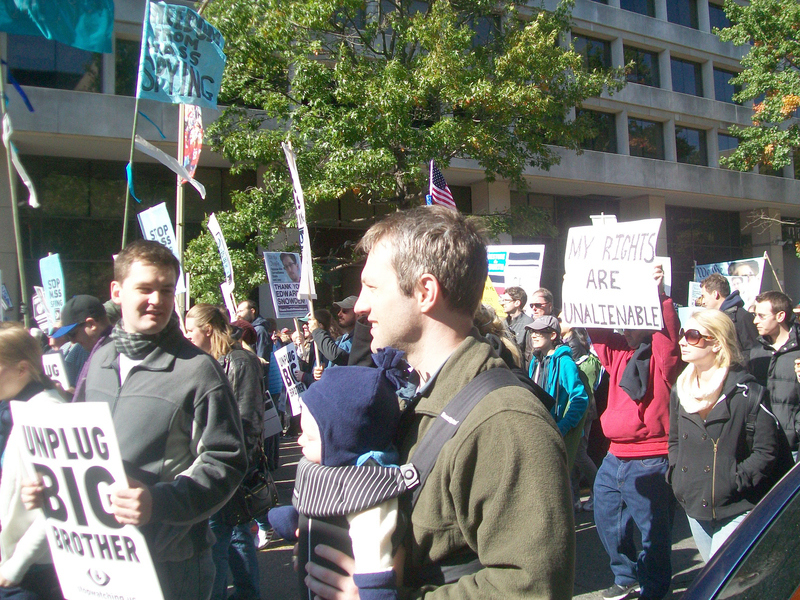 There was a definite "BS" and "AS" order to things at the major Stop Watching Us rally against government surveillance in Washington, DC, on Saturday. That’s Before Snowden and After Snowden, and though it doesn’t matter really which is which, it helps when charting the evolution of a protest movement, especially one that seems to be on a speed-of-light trajectory. Before Snowden activists are those who came up from the trenches and felt virtually ignored – until now – when they tried to raise alarms over the level of spying and snooping and misuse of the Patriot Act since it was first passed in 2001. Then there are the After Snowden types, who told Antiwar.com that Snowden’s leaks, which have provided the most elaborate detail about the government’s warrantless data collection and online surveillance to date, compelled them into action for the first time, enough pack a bag and head to Washington for the weekend to protest. What’s important is that both sides came together Saturday in a fusion of purpose. But do they represent a critical mass, or just the beginning of something that may not last beyond tomorrow’s news? Author and columnist Jim Bovard, who was on hand, with camera, for the day’s activities, reminded us that the last eight years are pockmarked with lost opportunities for outrage – beginning with the 2005 New York Times expose of the Bush Administration’s warrantless wiretapping program. That story won a Pulitzer, but the paper held off publishing it until just after the 2004 presidential election, which allowed President Bush to avoid any painful political retribution at the polls. The expose, as powerful it was toward building a case against the misuse of government police powers post-9/11, only succeeded in forcing congress to re-jigger the Foreign Intelligence Surveillance Act (FISA) to make it legal to spy on Americans, and to make the already suspicious more suspicious. But mainstream America eventually moved on. "I hope that same nonsense doesn’t repeat itself this time," Bovard said, shaking his head. 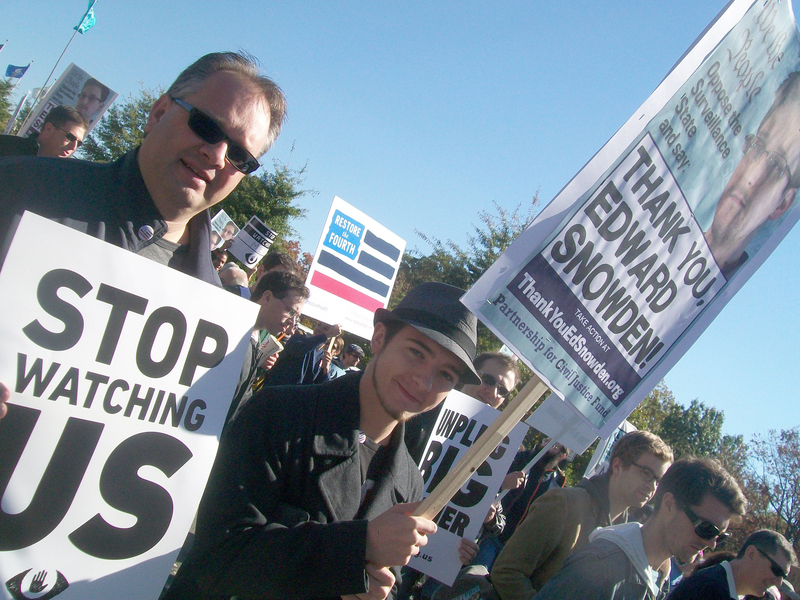 But against the blazing backdrop of the sunny October sky, the blue and black signs offering many thanks to Edward Snowden and demanding an end to massive data mining and online surveillance, there seemed to be no stopping this movement from claiming that critical mass, at least on Saturday. "I’m happy to see people raising hell," said Bovard. "These are people who will blog about this, post to Facebook and Twitter and help build a fire under this." Corey Sturmer, who had traveled with girlfriend Charlee Eades from North Carolina to protest, agreed. "When Snowden came out with this, that’s when I knew we had finally captured the collective consciousness. The collective mindset shifted. People are now generally more aware of it (spying)," he said "(Snowden) was a big event." But while people are "aware" of Big Brother, are they any more willing to try and unplug him? Stop Watching Us is the umbrella organization that brought together a coalition of some 100 privacy advocates and political activists as far flung in ideological positioning as the ACLU and the Libertarian Party and Daily Kos and Freedom Works, to pull off Saturday’s rally. A day before, they sent a squadron of representatives to Capitol Hill to talk directly to their representatives about government overreach and how Snowden’s leaks, translated in a continuing series of news articles by The Guardian and The Washington Post, have galvanized their constituencies – "the average citizen" — like no other time before. "Advocates and the public have been ignored for too long," and we "have had to accept that privacy is dead," announced Khaliah Barnes, administrative law counsel at the Electronic Privacy Information Center (EPIC), which has been fighting the NSA’s collection of so-called "meta data" in court. Barnes told the crowd that EPIC’s court petitions are finally getting a reaction from the agency, which EPIC interprets as fear. This is progress, considering the silence that pervaded the early days of the Patriot Act, where the center’s protests were often met with silence, and then scorn. "First they ignore you, then they make fun of you, then they fight you…then, you win," Barnes repeated several times for effect. "By finally having our voices heard we are winning," she said. Organizers said Saturday that the rally attracted "more than two thousand" attendees. While in actuality, it looked more like the lower end of that generous estimate, the make-up of the crowd proved to be more telling than its numbers. First, there was no sense of major hangover from the antiwar protests of the preceding decade, or even the more recent Occupy Wall Street encampments. This meant that instead of a rainbow of causes using the Stop Watching Us event to raise their disparate flags, mostly everyone there stayed on-topic, under one flag. They included mostly twenty- and thirty-somethings (with a healthy sprinkling of us older folks) looking like they merely stepped out of their day jobs as parents, students and professionals to proclaim that yes, they had reached their limits, and they weren’t going to take it anymore. "Suddenly we, the American people, are the enemy. When did I become the enemy? I don’t mean to shout at you but I’m just getting all fired up," exclaimed Sommer Gentry, who traveled by train from Baltimore to march. 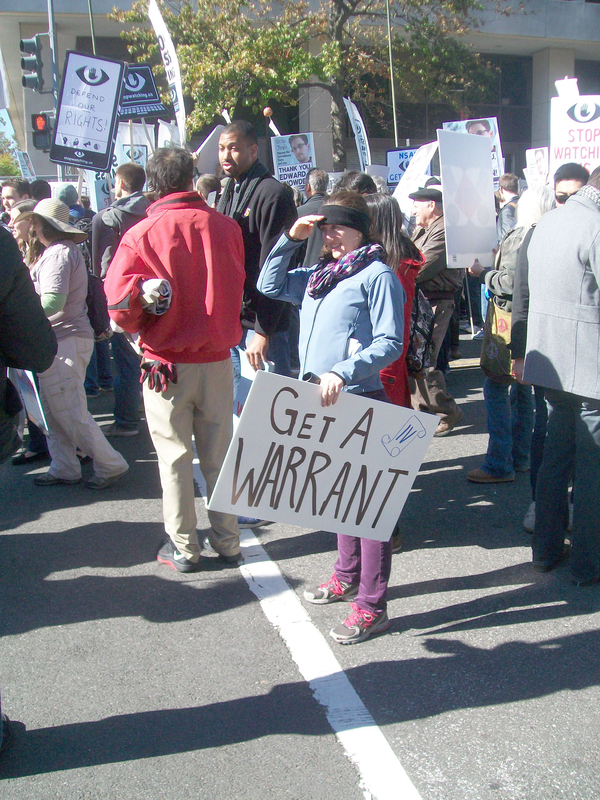 She carried a sign that said, "Get a Warrant," and told Antiwar.com that she first got interested in how the government was misusing its powers after "the TSA (Transportation Security Agency) touched me in a way I consider sexual assault" at an airport security checkpoint. "I really believe these issues are all related." Aside from a few Halloween-y exceptions, there were no costumes, tie-dyes, feathers or face paint. Just a lot of pictures of Edward Snowden (who lent this statement via Moscow to the proceedings), and a general consensus that Washington had gone too far. Oh yeah, and a lot more mainstream reporters and cameras than are typically seen at these events. Which was good when speakers like Rep. Justin Amash, a conservative Republican in the U.S House of Representatives, took the stage in support of the effort. 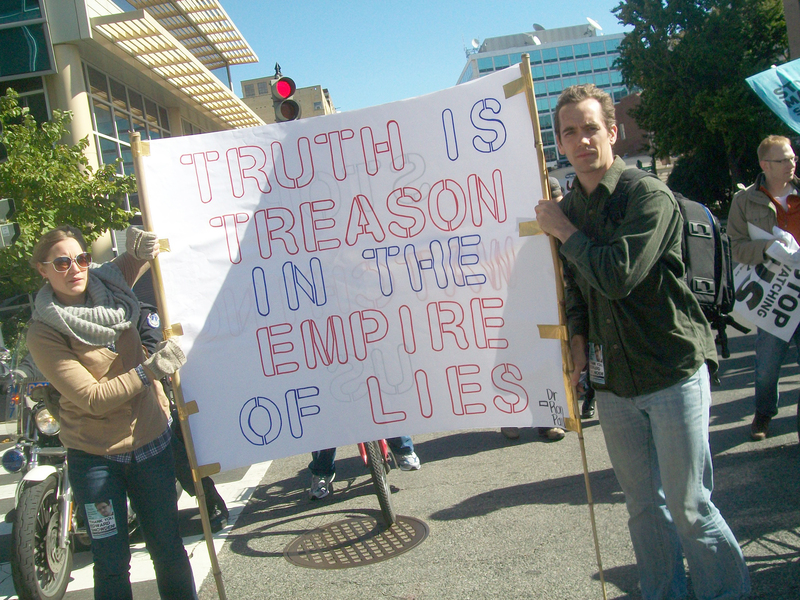 Eades, who was holding a sign with Sturmer that read, "Truth is Treason in the Empire of Lies," said, "writing my senator will do nothing for me, that is why I drove all the way here from Durham, North Carolina to be here." She added: "Before the Snowden leaks, we knew, and were suspicious of, these programs for a long time. Edward Snowden put it out in a global and impactful way. It’s having an impact now." Just take Dakotah Henderson, who traveled from Roanoke, Virginia with dad Sam for the rally. It was his 18th birthday Saturday. He said the Snowden revelations had sparked his newfound activism. Government surveillance, he now believes, has become a threat to American democracy. "I expected Obama to do what he said he would do as a senator (in 2008) and end the illegal warrantless wiretapping. I believe it’s important to do what you say," he said. News reports based on the leaks – the most recent, that the NSA had been monitoring the private calls of some 35 foreign leaders, including Washington’s closest allies – have forced the government to respond, attempting to allay the fears of other governments, citizens, even businesses that feel manipulated by government authorities. The issue has spawned real debates about the limits of power, over-classification, and whether or not our rights are being subverted by national security interests. The careers of journalist-activists Glenn Greenwald and Laura Poitras, who broke the first stories for The Guardian, have hardly faltered, in fact, they have flourished as a result of their work, catapulting both into the mainstream and inspiring a whole new front for their investigative endeavors. Whether or not this signals a sea change in popular outrage – a critical mass – remains to be seen. But if the spirit and vigor behind Saturday’s protest is any indication, they are at least halfway there.